Another talented artist, Monita Bijoriya from New York and her gorgeous mehandi designs. Enjoy Zuri’s interview with her. I never seem to get tired of looking at mehandi designs! They fascinate me and remind me of a time when I took a summer course on how to apply mehandi. Talented women like Namrata, Kiran Sahib, Laraib and Sumeyya have taken the art of mehandi designs to a totally different level. Zuri is privileged to have another talented mehandi designs artist featured in this segment. 1. Tell us about yourself – when did u begin applying mehandi and how did u think of getting into this line? I have been applying mehandi since last 10 years professionally, but it was my hobby since childhood. Initially, I was working full time as an architect and I never thought mehandi would become my profession, but now I am totally loving it. I am an “Ash Kumar Certified” Henna artist, and have also won the title of “Mehandi Maharani 2013” worldwide, a contest hosted by maharaniweddings.com and judged by Mr. Ash Kumar himself. I personally love all kinds of styles, henna has so much to offer, and I do not prefer to stick to a same pattern or style. However I consult with my client to fully understand the requirements and desired look. Then I customize the mehandi design to complement her style and personality resulting in making her feel extremely special for her big day. 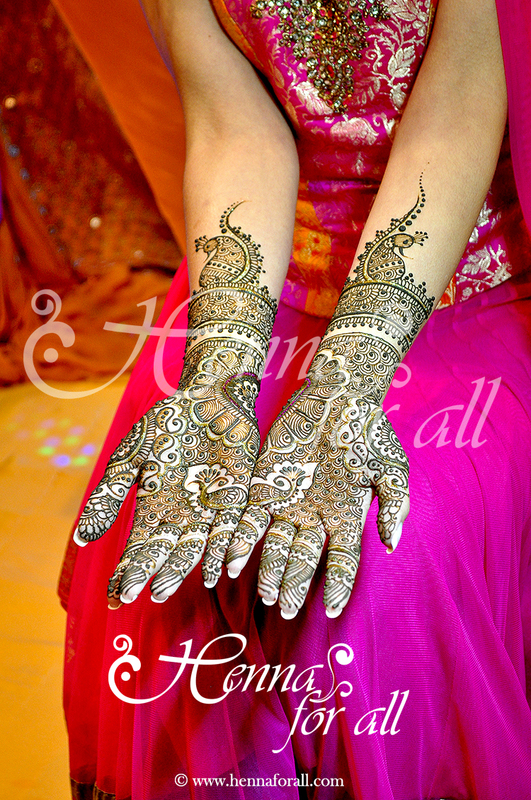 Bridal mehandi designs are always traditional. The latest trend is to mix traditional with other styles to suit a clients taste. I get most inquiries for a traditional look; not necessarily very intricate, but traditional elements like dholak, kalash, bride groom face etc. My mantra is to come up with a design to complement my clients personality – whether it is traditional, Indo-Arabic, or contemporary. I applied mehandi for this bride who has got the most work done from me till now. I worked for more than 6 hours and I’m glad all the effort paid off as she was very happy with the end result. She has been the sweetest bride I have ever met, and I will remember that experience forever. 4. What are your most important tips to take care of mehandi design after applied? Leave paste on for a minimum of 4 hours. Keeping it overnight will give best results. Pick or scrape paste off after 6-8 hours. If paste falls off earlier, don’t panic. It’s done it’s job. Do not wash with water for a minimum of 24 hours if possible (48 hours is even better). Design will progress from orange tones to burgundy or brown depending in about 48 hours. Color may continue to deepen even longer on some individuals. The warmer the body temperature, the faster and darker the mehandi will stain. If you are cold, try drinking something hot before you start. 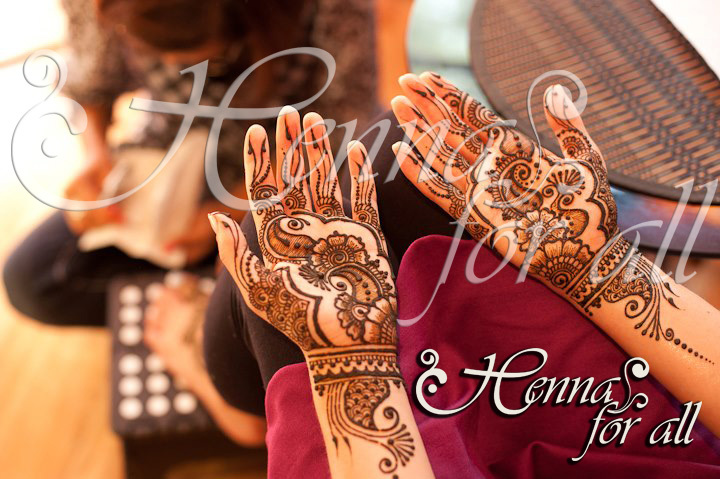 You can have a look at my work on www.hennaforall.com and follow me on facebook here. Enjoy mehandi designs by Monita Bijoriya. (Published with permission of Henna for all. Please don’t use these images without permission from the original source).